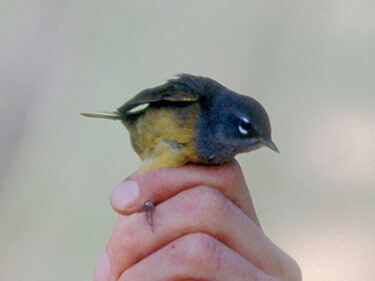 Description: Olive-green above; yellow below; bold white broken eye ring. Male has slate gray hood and bib. Female has duller gray hood and bib. 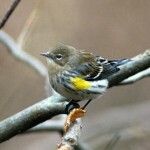 Immatures have brownish-gray hood and gray throat, and fairly distinct breast band above yellow belly. Behavior: Nests on the ground; hops rather than walks. 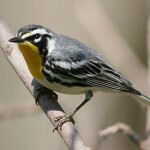 Habitat: Migrants found in dense undergrowth near streams, hillside brush, and in dense stands of weeds such as thistle and sunflowers. 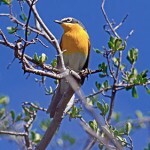 Where in Nebraska: Rare spring and fall migrant in western Nebraska. Most of records are from Panhandle. Reported as far east as Platte County. Fun Facts: They generally migrate at night.